on Chestnut Street 1. It is in an excellent location a. close to schools b. close to stores, downtown, and Detroit busses c. The neighborhood is one of best in town. 2. It will have plenty of room. 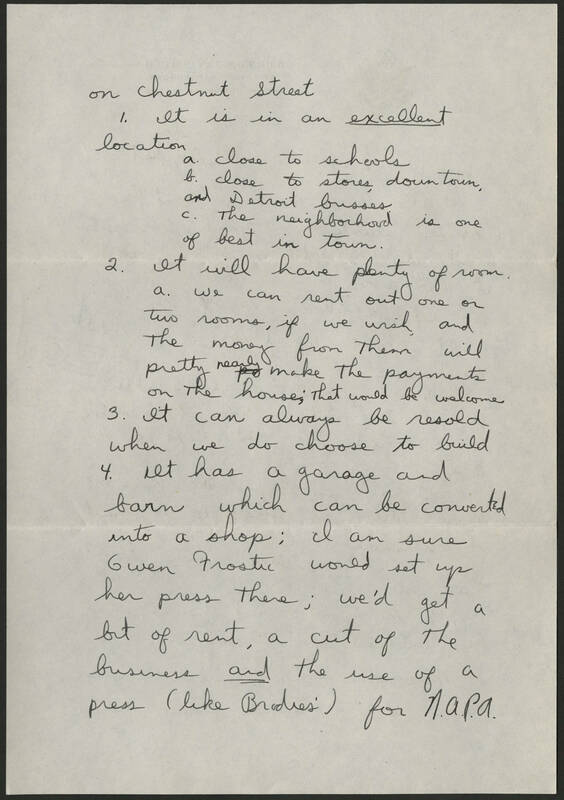 a. we can rent out one or two rooms, if we wish, and the money from them will pretty nearly make the payments on the house; that would be welcome. 3. It can always be resold when we do choose to build 4. It has a garage and barn which can be converted into a shop; I am sure Gwen Frostic would set up her press there; we'd get a bit of rent, a cut of the business and the use of a press (like [Bradies') for N.A.P.A.